Phong Nha Ke Bang National Park is a picturesque park surrounded by mountains, a vast network of caves, tropical forests and underground rivers. I highly recommend adding this to your Vietnam tour! Since 2003 the park has been listed as a Unesco World Heritage and is a perfect place for those who desirable adventure. The park is home to hundreds of cave systems and spectacular underground rivers has made Phong Nha a wonderful place to visit. 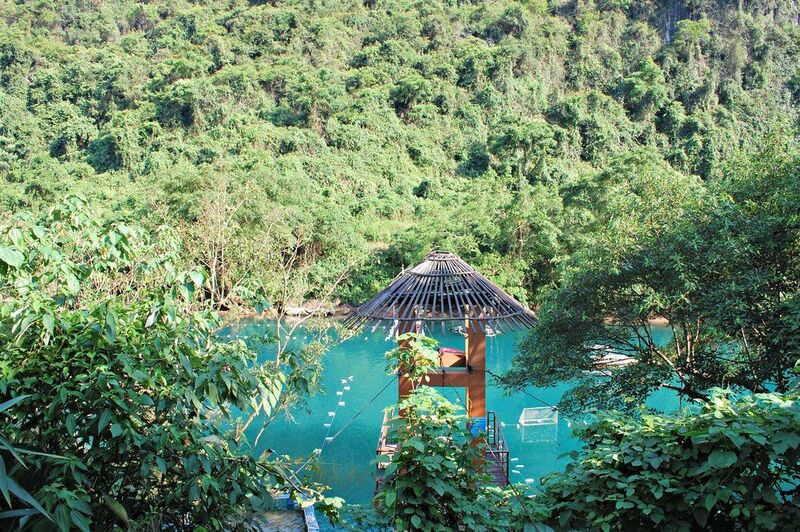 After being in the bustling cities of Vietnam Phong Nha was the perfect place to escape to and be with nature. How Many Days Should You Spend in Phong Nha? We had two full days in Phong Nha but wish we had longer! This was enough time to cover the town and go on one tour which included two of the cave and botanical gardens. Ideally having three to four days would be perfect as it will give you more time to explore and relax during the heat of the day. ATMs aren’t guaranteed to work and it is a common thing that they lose connection. I highly recommend taking out the money needed before you arrive. When we were visiting Phong Nha everything we paid for was cash only. Just to note: ATM’s come with their own challenges, depending on the bank some will only let you withdraw 1,000,000 to 2,000,000 which is 35 to 70 gbp. Look for Citibank or HSBC ATM’s to get out more money as they allow you to withdraw more money at a time and means fewer bank fees! Read more about What You Need to Know Before Going to Vietnam here. Getting to Phong Nha will require a little more planning but it’s easy if you start your journey at Dong Hoi which is the closest city to Phong Nha. There will be local buses run from the city to Phong Nha or alternatively it is easy to get a taxi from the city. Travelling from other major Vietnam cities the buses are the easiest option but the times aren’t always as friendly. I have listed the routes I would recommend below. The train runs along the coast in Vietnam and will be able to get from the north or the south to Dong Hoi. We caught the train from Hanoi to Dong Hoi which was about 10 hours journey. The train arrived at Dong Hoi at 6.24am. From there you can either catch a taxi or local bus. Read more about Overnight Trains in Vietnam here. Once you are off the train, walk up the road and in most cases there will be a bus waiting to go to Phong Nha which only cost 50,000 for tourists. It’s not an official stop but the locals know they will be able to pick up backpackers and therefore make it a stop just after the trains arrive. The stop is located at the end of the road on the left-hand-side at the T-junction. I’ve added the bus stop and train station on the map below to help demonstrate where the T-Junction stop is (it is the little yellow bus on the map). Psst… You can save the map below. You can get the bus from the Nam Ly bus station (Ben Xe Nam Ly). Look out for the bus that has a sign saying B4 and Dong Hoi – Hoan Lao – Phong Nha written across the windscreen as this will be the bus you need. 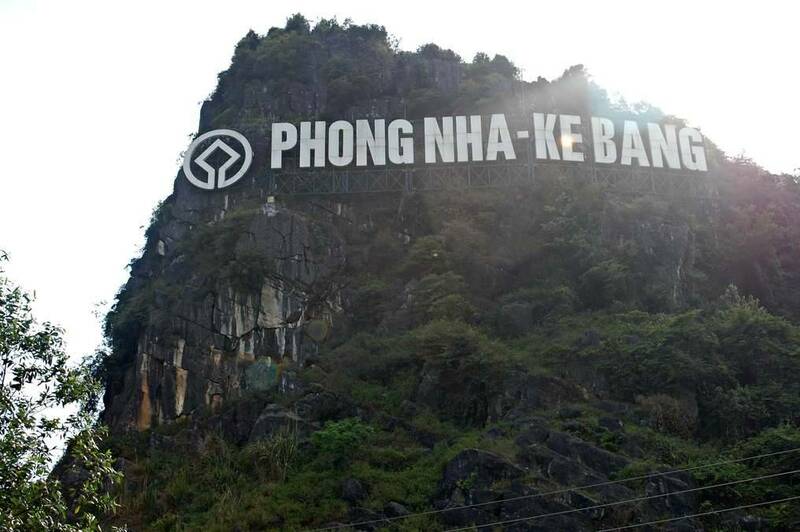 Eventually, you will see the Hollywood style sign of Phong Nha Ke Bang which is the town located in the park. The bus network in Vietnam is fantastic and there are plenty of options to get around Vietnam. There are buses running from the North to South route and you will be able to get buses from major cities of Hanoi, Ninh Binh, Hue, Da Nang, Hoi An and other cities in Vietnam. Generally, you can book buses at a local travel agent or your accommodation. It is the easiest option to get to Phong Nha but you may not arrive at the best time. The bus from Hanoi arrives at 4 am so you may need to wait outside for a couple of hours depending on your accommodation. As easy option is to catch a Taxis from Dong Hoi to Phong Nha. The prices should be between 400.000VND and 500.000VND which is about £12 to £15. Make sure you negotiate the price before getting in the taxi as most do not run their meter. 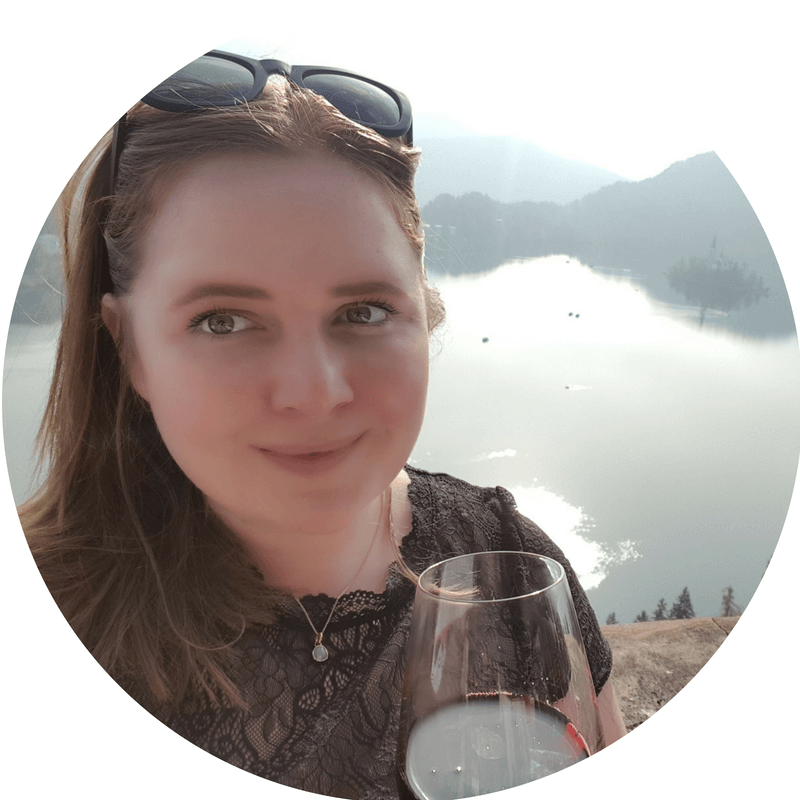 Where to stay Phong Nha? Phong Nha is a small village, the main street has hostels, hotels, travel agencies, cafes and restaurants. I have included a few hostel recommendations below. The most popular is Easy Tiger, I would say that the majority of tourist stay here. When I was enquiring to stay there, they said they have a two-night minimum policy, as we were only staying for one night it was silly to pay for two nights. You also won’t find any advertised cost for the rooms and will need to email them to inquire. Easy Tiger has a swimming pool and happy every day from 5pm to 9pm with live music. We stayed at Van Ahn Backpackers, they were the loveliest family and helped us out our whole stay. It was simple things like they checked us in early when we arrived at 8 am and then gave us breakfast (Bahn Mi) and coffee. The accommodation was well priced at $11usd for a twin room and also had air conditioning, bonus! It’s across the road from Easy Tiger so if you want to join in the fun at Easy Tiger it’s a quick stroll across. Gecko is another hostel to consider, it is a boutique hostel in the heart of Phong Nha tourism Centre and has to 120 beds with both dorms and private rooms. A restaurant, a cool bar, and tour services are also available. 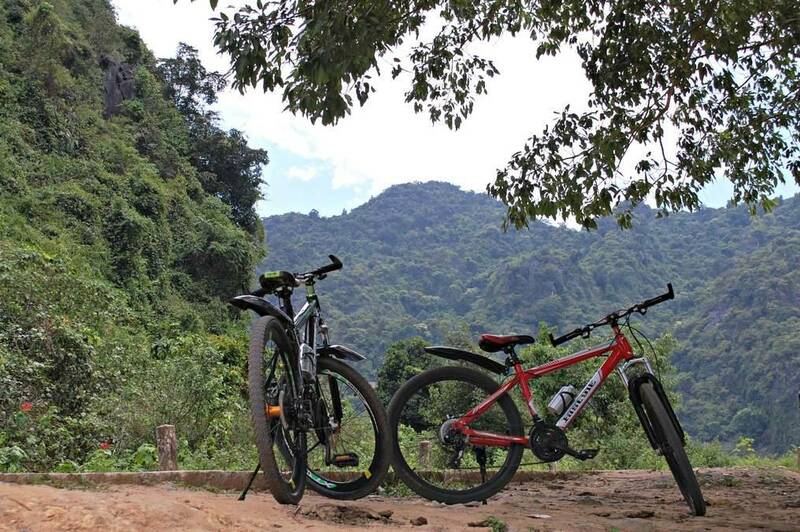 Getting around Phong Nha Ke Bang National Park? The village itself is quite small and you can see it by either walking, cycling or scooters. The national park surrounding is extensive and requires either a tour or a scooter, although you can do parts cycling if you don’t feel comfortable renting a scooter. If you rent a scooter it costs 100,000 vdn from the Van Ahn hostel for half a day. We decided scooters weren’t right for us and rented bikes. The bikes were 50,000 vdn each, she did say 60,000 and just said the hostel advised it was 50,000 each so we had the price dropped. Phong Nha Ke Bang has a vast network of caves, it’s a must to explore caves along with tropical forests and underground rivers. There are two caves in the village, Phong Nha Cave and Tien Son Cave. Both caves are sasily accessible by boat from the tourist centre. Caves costing 80,000 vdn to 150,000 vdn and a boat fee on top, price changes depending on how many people. Easy Tiger runs a talk every morning at 9 am about the Phong Nha Cave and Tien Son Cave. Not only will the talk provide you with all the necessary information about the area but a great group that you can share the boat fee with! The more people you have to fill the boat the cheaper the boat fee will be for you. Phong Nha is the first cave in the area that opened to the public. Not only is it beautiful but there is a lot of history associated with Phong Nha Cave during the Vietnam war. The cave was used as a hospital and place of refuge during attacks which brings back memories to the locals. Tien Son is a smaller dry cave just a few meters above the Phong Nha cave and will take you another two hours to visit. It also requires you to climb the 400 stairs but you will be rewarded with a beautiful view of the town below. I highly recommend the paradise cave, botanical garden and dark cave tour. You can visit the caves and botanical garden without a tour but you will need a scooter or car to get to the entrances as there is no public transport options to get there. 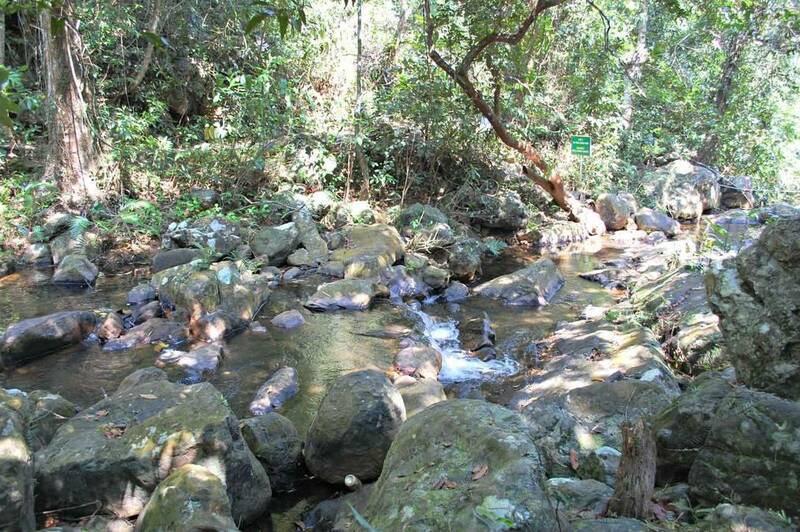 The park has abundant with wildlife, plants and beautiful waterfall. Paradise cave was discovered by a local Vietnamese man in 2005 and has been classed as the longest dry cave in Asia. To get the cave it’s a 1km walk or a golf buggy and then 570m trek up a hill through the jungle. The Dark cave is a mix between an adventure course and cave tour. If you weigh between 40kg and 90kg you can zip line down to the lake, be warned there are no brakes to slow you down so it is a harsh landing. Be prepared to get muddy in the Dark cave, by the end of the tour you are soaked and your clothes are covered in mud. One of the highlights is the ‘chocolate lake’, the lake is so dense that you float around and struggle to stand. Phong Nha Ke Bang is the biggest national park in Vietnam and is one of the must-see parks in South East Asia. Explore the national parks famous tropical forests, underground rivers, ancient limestone karst mountains and a vast network of caves. Option two is to take a tour exploring the jungle. We didn’t book a tour in advance and booked whilst we were in Phong Nha with our accommodation. However, the tour we booked was not the tour we ended up on. It did work out extremely well as we didn’t choose the tour we wanted due to our budget and that was the tour we ended up on! If you’re really keen on doing the tour you choose then make sure you get put with a company running it that day as they don’t run tours if there aren’t enough people. We only spent a short time in Phong Nha and only managed to go to one restaurant which was the Bamboo café. There are enough choices in the town generally serving either Vietnamese or western food. Bamboo cafe (Western food) – it was one of the few cafes we found that had wifi. One of the ladies that work there is very entertaining. When we enquired what we should do in Phong Nha, she quickly gave us a map and was very excited when she was explaining what to do. Wild Boar Farm where you can catch, kill and cook your own chicken. The lady at the bamboo cafe said she would rate Tristan’s manly hood depending on killing a chicken and the quantity he ate. Until he accomplished that he wasn’t a big strong man haha… Being a vegetarian this wasn’t an appealing option! D.Art zone (Vietnamese traditional food and drink.